The DEAR Foundation helps people in need, particularly women and children. The DEAR Foundation does this by supporting humanitarian projects, administered by NGOs throughout the world. The DEAR Foundation is financially independent, but will be pleased to accept individual donations, bequests and contributions from charities. This enables the foundation to provide even more help. The headquarters of The DEAR Foundation are located in Switzerland. It operates very efficiently with a small team, and accompanies and checks each of the projects it supports on location. 100% of the donations are injected into the projects. 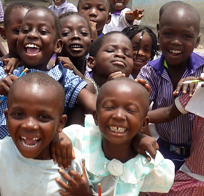 Since 2011, The DEAR Foundation has been supporting the YAP programme - the Youth Advocacy Programme - to help the young people of Ghana via Opportunity International, Switzerland. Since 2011, The DEAR Foundation has been supporting the construction and fitting out of a breast centre at the EMEK Medical Center. For over 20 years, our partner organisation, Perspektivy, has been working on changing the mentality, and tending to the special needs of severely handicapped children in large state-run homes. Far too many children loose their mothers or husbands their wives. Removal of all cultural taboos surrounding breast cancer and self examination. Give access to medical information about breast cancer, offer advice on what you can do in your everyday life if you have been diagnosed with this illness and create valuable networks, self-help-groups and links worldwide. Even people suffering from abject poverty can lead a decent life, and special attention should be paid to positively developing and supporting children. The main aim is to support children and women, so that eventually they are no longer dependent on help and handouts from us and others. All people are equal. If there is any doubt, we place ethical and moral values over religious and cultural particularities. We continually strive to keep up with the most up-to-date knowledge and teachings in all fields of development aid. Would you like to have a positive effect on the life and future of a child? If you send a donation to The DEAR Foundation, 100% of it will be injected into your desired project on the following working day. For donations of over CHF 100, a donation receipt will be issued automatically in January of the following year. We will be happy to advise you, without obligation, so that your estate or part of it will lastingly help the poorest in the world, and help avoid unnecessary costs.